At Twitter’s analyst day, CFO Anthony Noto said one of the company’s goals is the be a top revenue generating internet company. What does that mean? 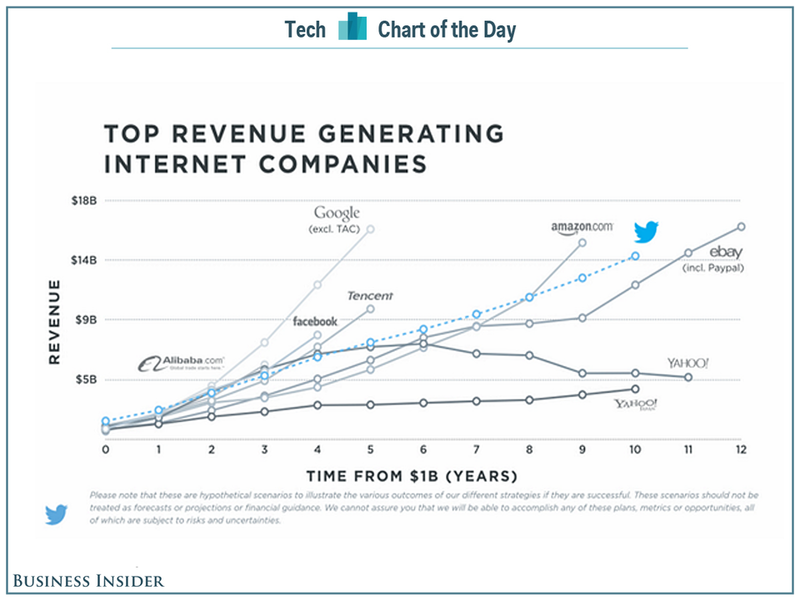 Well, he flashed this chart which shows top revenue generating companies, and how long it took them to get where they are after they generated their first billion. He said that Yahoo had an opportunity to grow then went sideways because it lost direction. He doesn’t want, or think, that’s going to happen to Twitter. The chart (which has the disclaimer that it’s not a forecast) suggests that Twitter will be generating $US14 billion in 10 years or so. This seems like an unusual, and risky chart to show. It puts a big target on Twitter’s back. It’s setting an expectation for Twitter to live up to. Setting big expectations, then missing them can lead to a company being hammered. 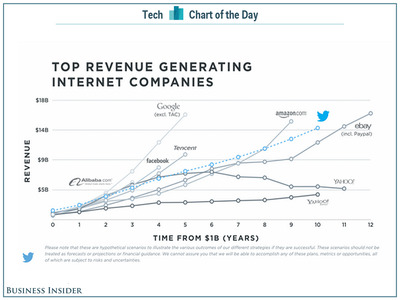 This chart, and everything else Twitter said at its analyst’s day is working for now. The stock was up 7.86% today.